Well I think it's a robin. I'm sure all you bird watchers will correct me if I'm wrong. They are rather cute and very friendly. I can't think what else it could be but it's not a very normal Robin. They usually have grey-brown crowns, no white flash on their wing and paler underbellies. Maybe it's a last year's juvenile? Cute - I remeber robins being so friendly and just perching near where one was working or sitting eating. Getting closer and more interested. 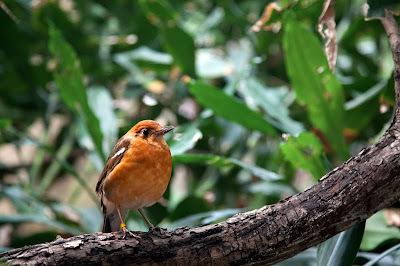 Indeed, it's an English Robin. American robins look a bit different! I don't think it's a robin. It's more like a chaffinch, with the white flash on the wing and more red underneath. Not a bullfinch, they have black faces. I agree. A chaffinch not a robin which has white on the lower chest and no flash on the wing. He's very cute but our robins in Canada don't look like yours so I don't know if he is or isn't! Good looking bird and you took a beautiful photo of it. That's not a robin but it does look like one. How on earth did you get close enough for that pic? So difficult to do that. Well done.